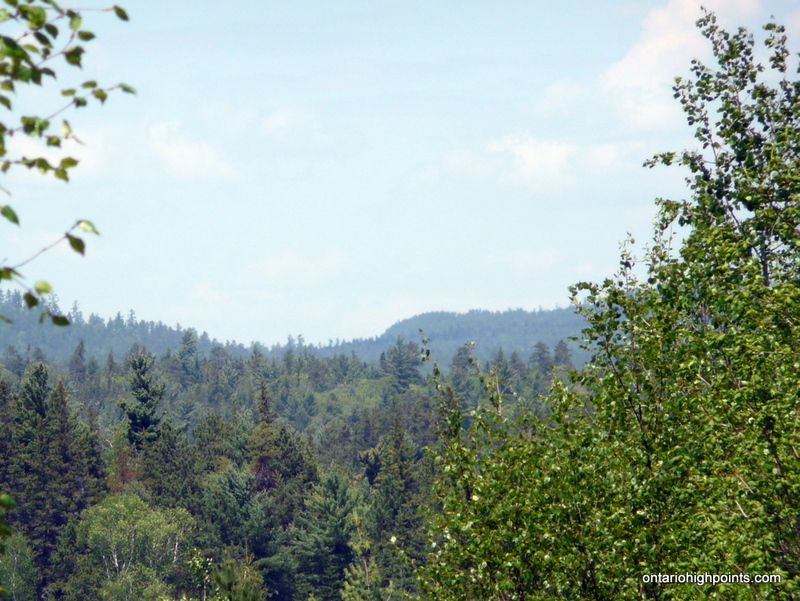 Wolf Lake Mountain is located just outside the boundaries of the world’s largest old-growth red pine forest; the Wolf Lake forest reserve. 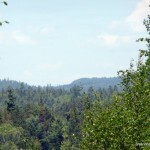 Named after the lake it stands over, Wolf Lake Mountain is the highest point within the boundaries of the City of Greater Sudbury. 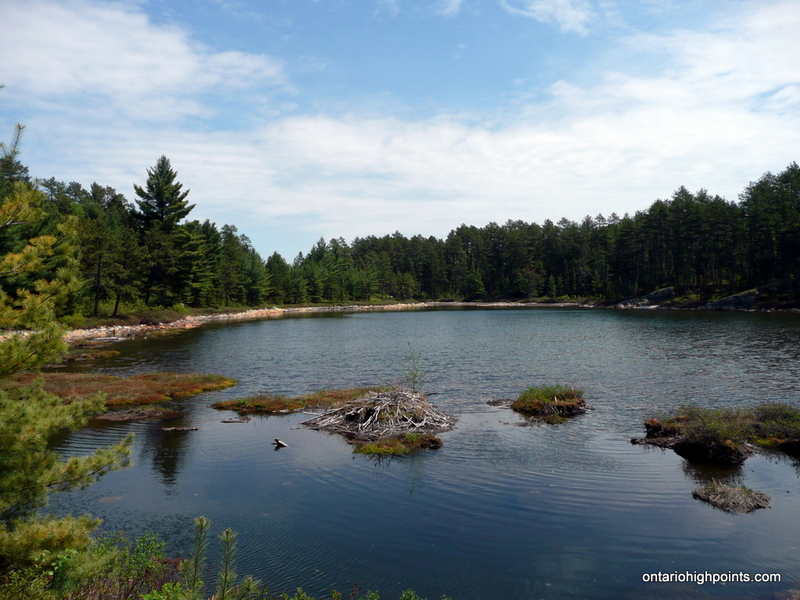 The area, commonly referred to as Chiniguichi, is a relatively popular canoeing destination with it’s clear acidified lakes, old growth pine forests and aboriginal pictographs. From Sudbury, proceed east on Highway 17 for approximately 20 km and pass through the communities of Conniston, Wanapitai and Stinson. Just past Stinson, turn left (north) onto Kukagami (Lake) Road and follow it for 21.3 km until reaching a fork where Matagamasi Lake Road branches to the left. Follow Matagamasi Lake Road for 4.6 km and then continue on Bushy Bay Road which forks to the left. Continue past the cluster of cottages/camps which dot the sliver of land between Lakes Wanapitei and Matagamasi. Shortly past the cottages, at N46 45.785 W80 38.409, a rugged hill with loose boulders must be ascended. Those with cars may wish to park on the shoulder here and continue on bike/foot. 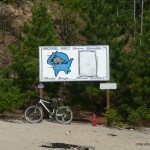 Follow the main road northward, past scenic lakes and across small creeks for 11.4 km until reaching and large open intersection marked with a Nickel Belt Snow Spriits Snowmobile Club sign. Turn left here at the fork. The road begins the 2.8 km ascent which has a few steep stretches until reaching the lookout of Wolf Lake Mountain. The actual summit lies north of the lookout. 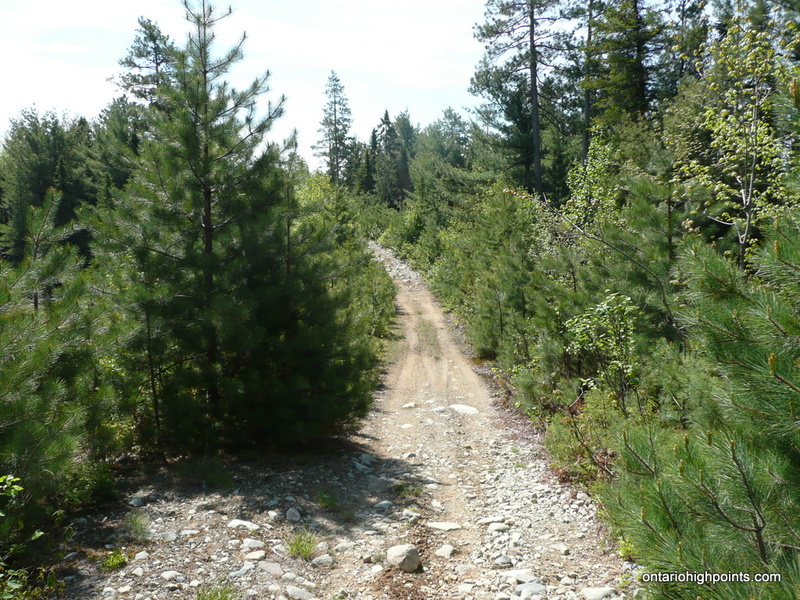 Continue for 0.3 km along the road and then head west (left) into the woods for a brief 200 meter bushwhack. The brush is fairly open and it is easiest to skirt the southern edge of the hill until making the final push north onto the summit. 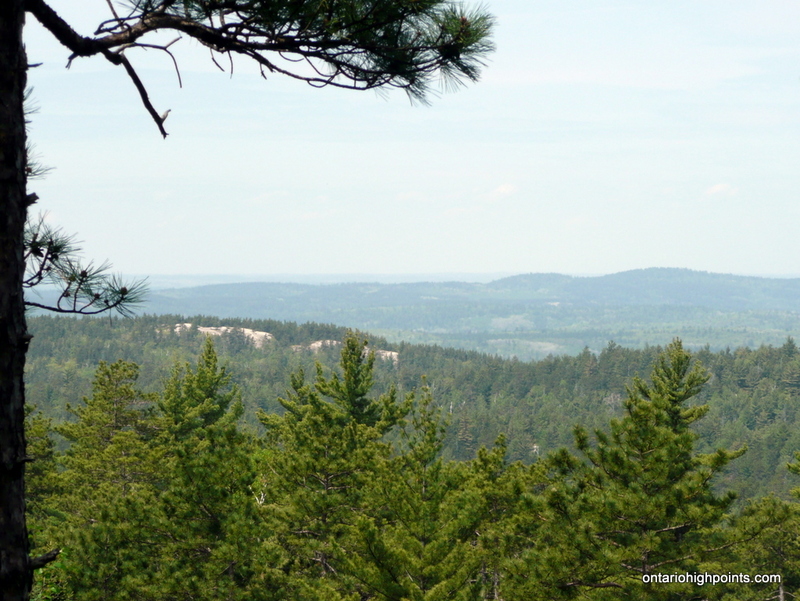 Having first spotted this peak on the Ontario County High Points list on peakbagger.com, I decided it would make a nice day hike from Sudbury where I was visiting family for the long weekend. Usually the May 24 long weekend is off limits for most sane hikers in Northern Ontario due to the abundance of black flies and mosquitoes. This year however, spring had come early and without the usual amount of rainfall, so I figured that I could risk the conditions for a day trip to Sudbury City’s highest point. Waking early, and with Environment Canada forecasting good weather I set out from Sudbury, eastward on Highway 17. After passing through Stinson, I found the left turn onto Kukagami Road. 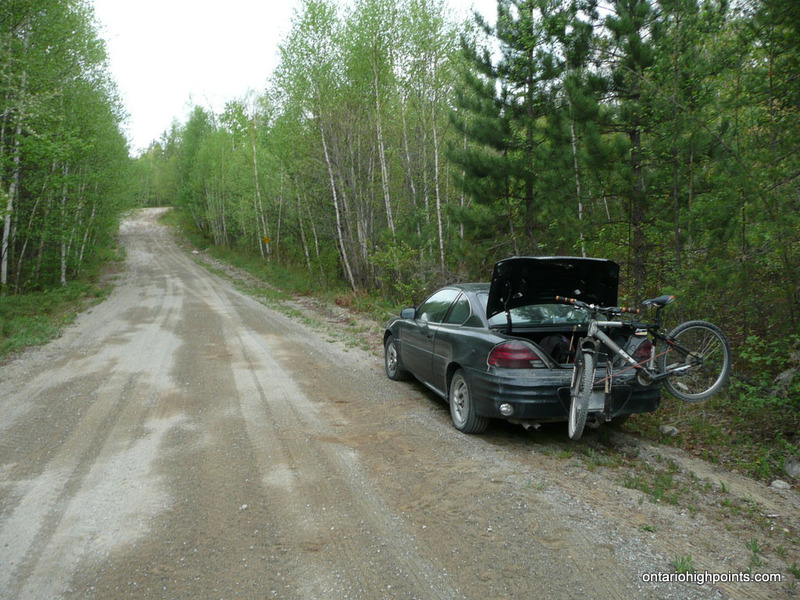 This gravel road is a gateway to the Wanapitei/Matagamasi Lake system, which is situated to the north. 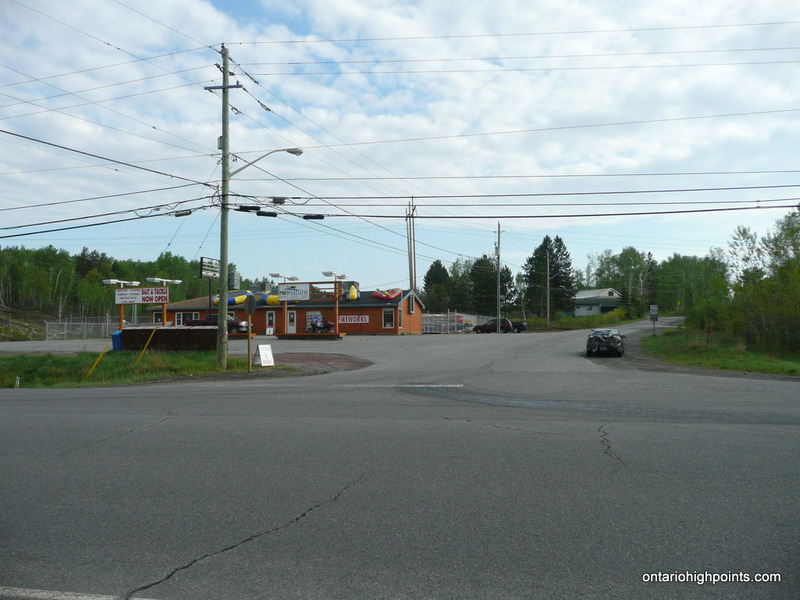 Driving northwards, I correctly made the left turn onto Matagamasi Lake Road but shortly afterwards, missed the turnoff onto Bushy Bay Road. Reaching the boat launch at the end of Matagamasi Road, I realized I had made a mistake and backtracked to take the left fork onto Bush Bay Road. Just beyond the fork, I passed a group of cottages which take strategic advantage of the land narrows which divides Matagamasi Lake from Wanapitei Lake. Road gets rough. Parked on the shoulder. Arriving at the base of a steep hill strewn with small boulders, I decided I could drive no further. I parked at At N46 45.785 W80 38.409, and prepared to continue my way on bike. As I suited up the mosquitoes were swarming, but strangely, this was the the worst of them I would see, and I didn’t have any trouble from them for the rest of the trip. I made good progress biking along the road until I hit my first obstacle. 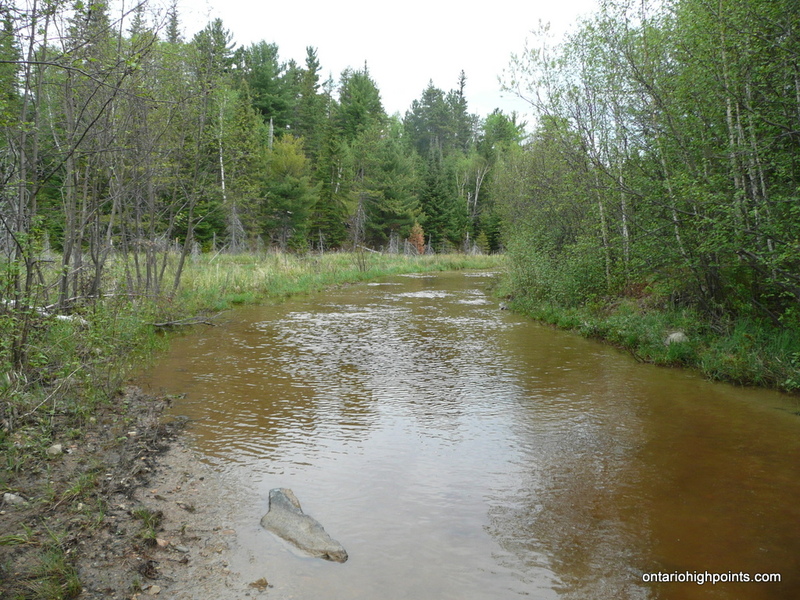 Some beavers must have dammed up a nearby creek, which flooded the road. In an effort to avoid the swampy areas on either side of the road, I decided to pedal right through the flood zone. 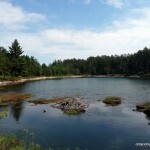 The ‘lake’ was deeper than I had hoped and as I pedaled my lower foot plunged into the water. I would have wet feet for the remainder of the day. Despite pedaling across a flooded road, the water levels in many of the lakes and marshes in the area looked to be significantly low. Along the route I passed by a marsh which had been become a mud flat. 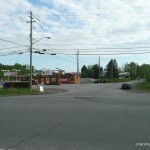 After an hour of biking, I reached an intersection marked by a Nickel Belt Snow Spririts Snowmobile Club sign. The sign marked the turnoff left (west) from the main road onto a slightly smaller road. A further 700 meters past the intersection, the road began to ascend steeply, so I decided to stash my bike in the woods and continued the remainder of the journey on foot. Only minutes into my trek by foot, I encountered something I had not seen before. 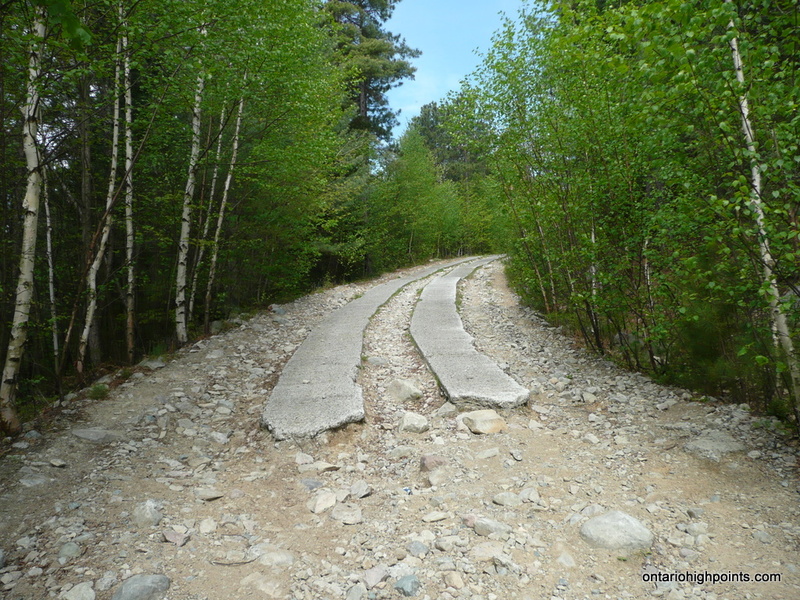 In an effort to combat erosion, concrete 2-tracks had been poured for the quads and 4x4s to drive along on their ascent up Wolf Lake Mt. 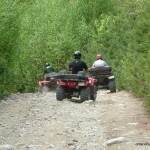 Quads descending Wolf Lake Mt. It took me about 40 minutes to ascend the remaining 600 feet (over 2.1 km) to reach my first objective, the lookout on Wolf Lake Mountain. 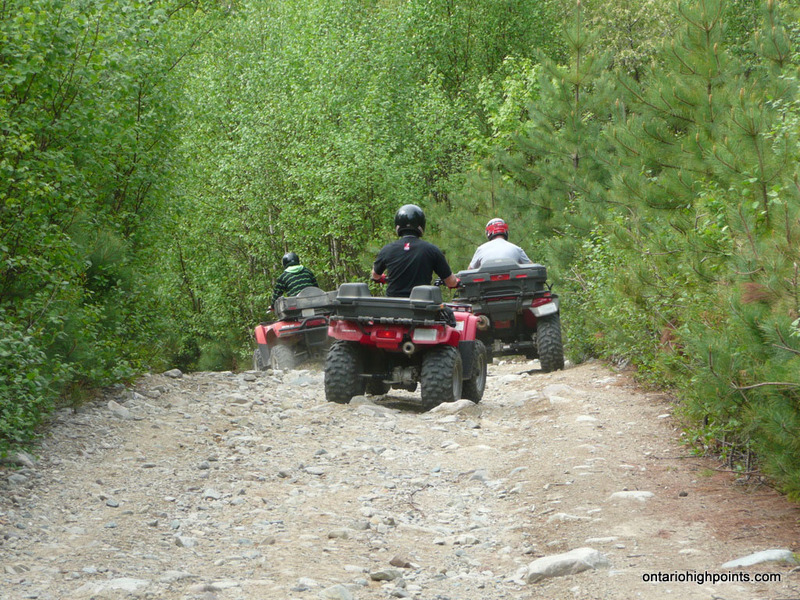 The area is popular with offroaders, and as I neared the top of the hill, I was passed by a small group of ATV’ers on their way off the mountain. The early day haze was lifting and the lookout afforded good views east towards the Chiniguichi region. Silvester Lake and Matagamasi Lake were visible to the southeast, Wolf and Dewdney Lakes were visible to the east and northeast partially obscured by a low lying ridge. As my main objective for reaching the highest point was not yet complete, I continued along the road for another 300 meters until I reached the closest approach along the road to the actual Wolf Lake Mountain summit. 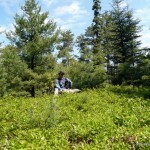 After completing a short and easy bushwhack through thin underbrush I emerged onto a broad summit. Like my previous treks to Ontario high points, determining the actual high point can often be difficult, and this was no exception. The summit area was made up of a small depression ringed by several candidate points. I visited each one several times, until I decided the southwestern point appeared to be the highest. Derek on the summit of Wolf Lake Mt. 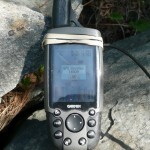 GPS elevation for Wolf Lake Mt. View west from the summit of Wolf Lake Mt. 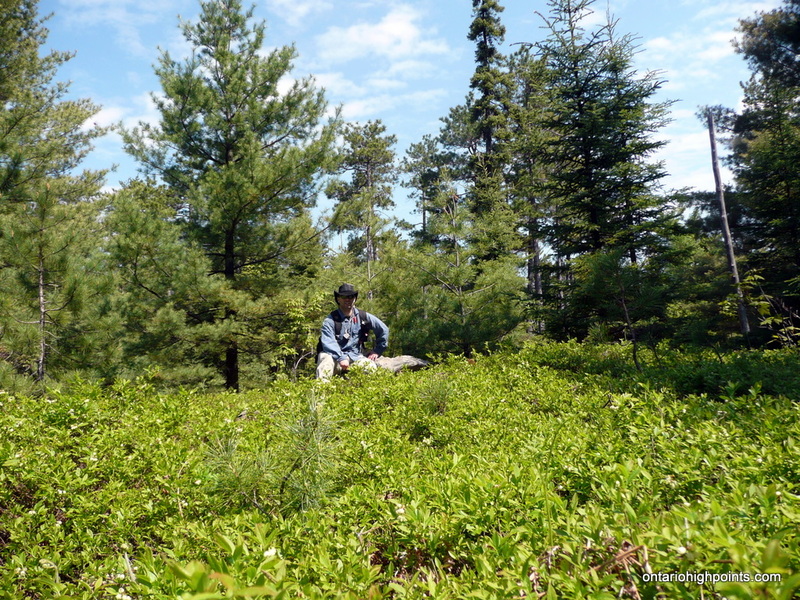 As the open forest allowed easy passage, I explored the area to the north and passed through wild blueberry pastures which afforded nice views of the hills to the west. As it was time to start heading back, I retraced my steps back down the mountain. 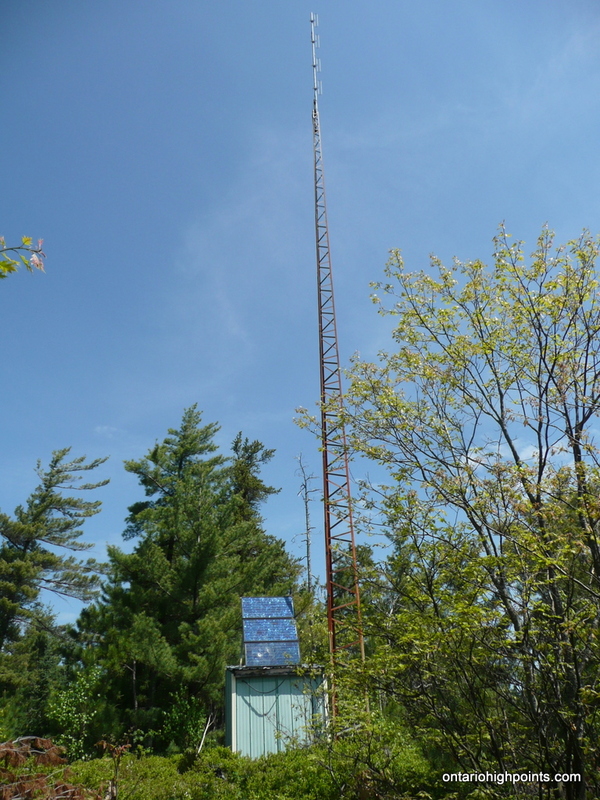 I stopped back at the lookout and took a short side trail to visit a tower which I had seen from the summit. Quad / 4x4 track on Wolf Lake Mt. 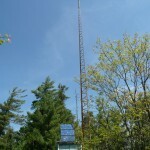 Tower near the lookout on Wolf Lake Mt. The day was really heating up, and with temperatures reaching the high 20s I had to stop a few times just to cool down and renew my water supplies by filtering creek water. Arriving back at the car just before 2:00 PM, I completed the 14.7 km x 2 (29.4 km) biking/hiking portion of the trip to and from Wolf Lake Mountain in just under 5 hours. 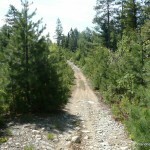 32.3 km – Road gets rough. Park here on the road shoulder if traveling by car. Continue on by bike or by foot. 44.4 km – Road becomes steeper as it begins to ascend the hill. Good time to stash the bike. 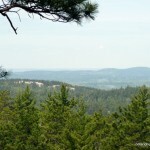 47.0 km – Wolf Lake Mountain summit. 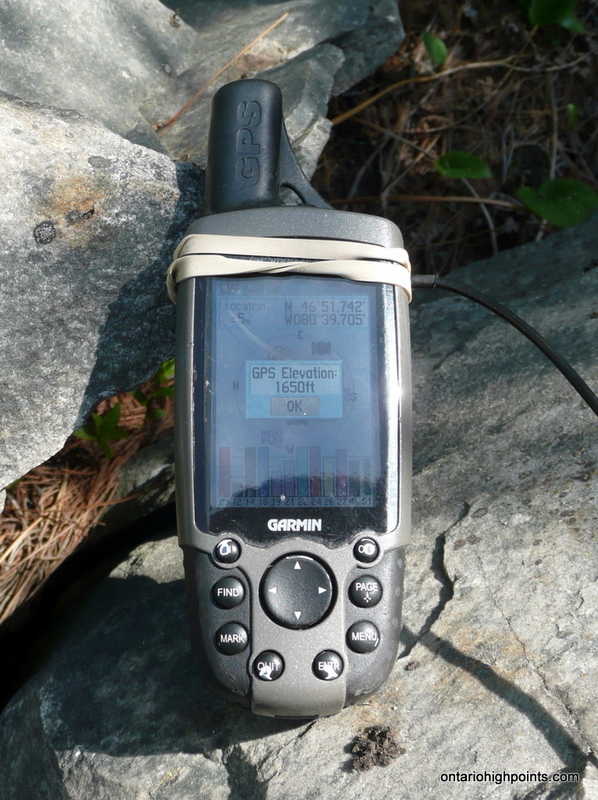 Hey, That was a really cool report of your trek up the mountain. Thank you for the easy to follow directions. I will be taking my family to see this wonderful sight.One question,could this mountain be skied up in the winter? I’m not much of a skier myself so I’m not a good judge of what can or can’t be skied. I suppose you could ski the flatter sections on the way to the peak and then carry the skis up the steep portions at the end. Keep in mind I dumped my bike when the ‘going got tough’ when I climbed it in the summer. Trying to ski into Wolf could prove dangerous. It’s all groomed snowmobile trails.going up Wolf is barely 2 sleds wide. Personally wouldn’t advise it. 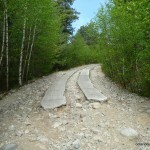 I would like to know how steep it is and for how many km, and do you see the old growth trees on the trail. 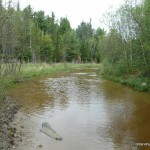 Also would like to know when would be the best time of year to go when trail is not flooded. Derek, the author of this guide appears to have hiked this trail in the late spring I have lived in the Sudbury area for a couple years and judging by the state of other nearby trails which I have hiked, most areas that are affected by spring-related flood waters seem to usually be dried up by mid-June to July. This largely depends on the amount of rainfall over the days/weeks prior of course. 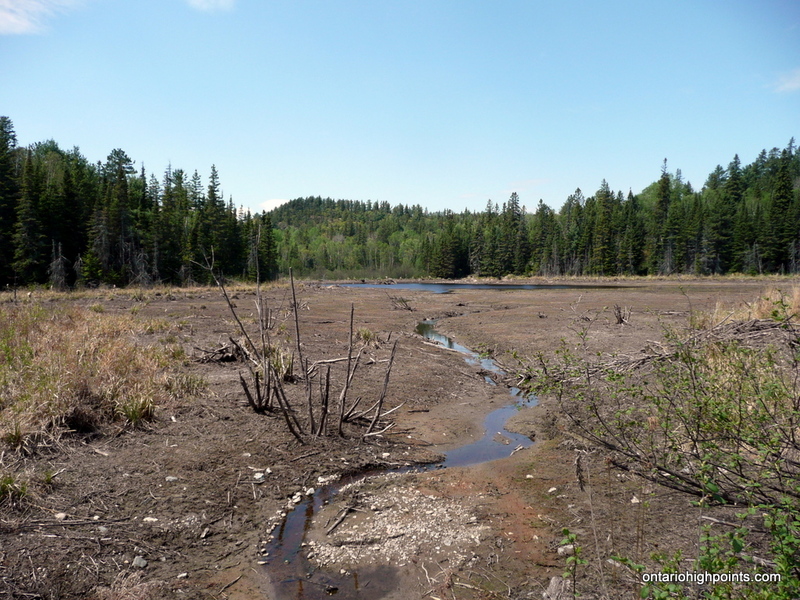 Also, an inconveniently-placed beaver dam (which they can construct in a relatively short span of time) could transform the driest section of a trail into a small pond in a matter of days. So, I guess I’m trying to say that you never really know what to expect until you arrive at the trail. In any case, I plan to check out this particular trail in the coming months and perhaps I will report back here as to the state of the trail. Nina, the last 2.5 kilometers is fairly steep and climbs 600 feet to the Wolf Mountain summit. 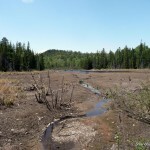 The trail was very dry when I hiked it, but as Shane mentioned, an inconveniently-placed beaver dam can and in my case did flood the road in one section. Would you need 4X4 to ascend or could you get by with all wheel drive? The old growth can easily be seen by continuing on past the Snowmobile Club sign along the road to the right. 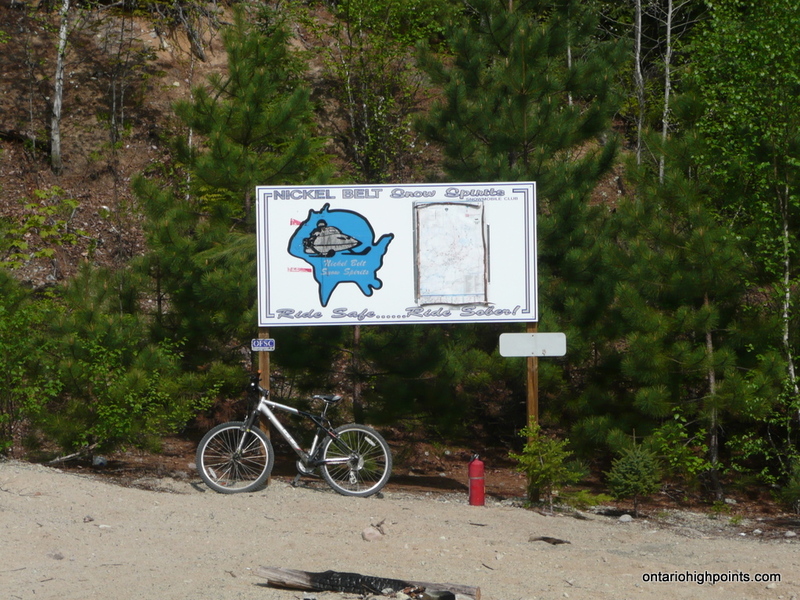 You can walk into Wolf Lake itself along a trail off to the right about a kilometer past the Snowmobile Club sign. Went by ATV to wolf mountain summit this last Saturday. You cannot run your ATV on the concrete tracks. They have spread apart and likely you would damage the tires on your ATV. So just ran on the side of them. Could not locate the trail to the tower.Everything is growing in. 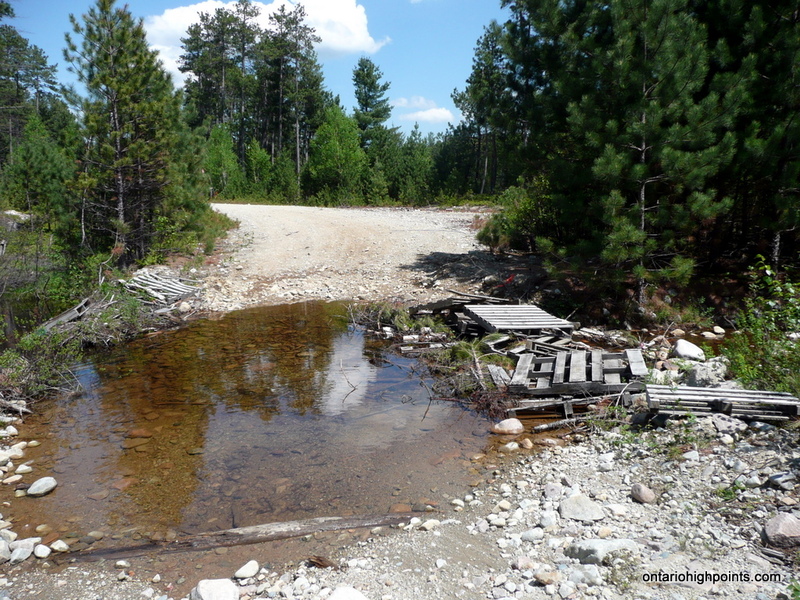 You could drive a four wheel vehicle to the sign of the snowmobile club quite easily.The makeshift bridge has been upgrades so that a vehicle can cross it quite easily.A lot of the terrain is changing constantly with tree and brush growth. Took some side roads on the left before the snowmobile sign and they seem to have done some tree cutting a while back and of course left oil jugs there. Me and a friend did the hike up the mountain today, final 2.8 km is very steep and rocky, but We were able to drive a front wheel drive Honda Civic up to the trail intersection ( where the info board is just before the steep final ascent to the top). 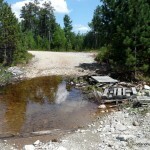 There was no flooded roads or bad washouts. It was a very clear day and we were able to see quite far from the summit. Just did it in my Chev with 5 people and two dogs it was a challenge.